A must read book for parents on how to safely incorporate technology and the online world into their lives through connection, understanding and proven strategies. No matter what age your child, you will get a great insight into the digital world and how we as parents can best help our children navigate this new world. 5.0 out of 5 stars5 Stars - Highly recommended! As a Mum of three young children I am always worried about how much screen time they should have and how to manage this as they grow older and become more dependant on technology. Parenting in a Digital World has given me some great tools to help our family, after reading it I feel much more confident about how to handle their screen time before the arguments begin. The book is well written with easy to follow tips and ideas and the author is clearly an expert in this field. I highly recommend this book to all parents! I bought this book as I was already struggling with managing devices and my 5-year old. It is a great read, well laid out and hugely informative and I have already started implementing some of the tips and advice. I have also found it very helpful for planning what to do with my kids as they get older. Highly recommended! 5.0 out of 5 starsHelpful, balanced, non-proscriptive, with great advice and suggestions. An insightful book which provides parents with helpful tips and advice on navigating the minefield of parenting in a digital world. The book helpfully begins by setting the context of how technology, with all of its advantages, adds to the challenges we face as parents, explains why pre-teens and teenagers are pre-wired to push boundaries and take risks, and then provides useful strategies for parents. It covers topics such as how much screen time is ok and how to analyse the different types of screen time when making that decision (eg playing a game vs being creative), and ideas for keeping the conversation going with our kids about online privacy and safety, and lots more. What I really like about this book is that it's non-proscriptive. The author offers helpful suggestions and explains why they might be useful and in which situations, giving lots of real world examples, without preaching at the reader. 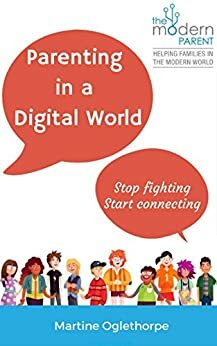 I would recommend this book to all parents who have kids using digital technology - which is pretty much all parents!